Looking for an All-Terrain Conversions dealer? Click Here to see our list of dealers! Convert both 2wd & 4wd Trucks & Suvs to become wheelchair accessible with the All Terrain Conversion by ATC. Both driver & passenger conversions available on the Chevy, GMC & Cadalliac platforms. ATC has been building wheelchair accessible trucks going on 5 years. CEO Steve Kitchin was involved in a auto accident that changed his life. 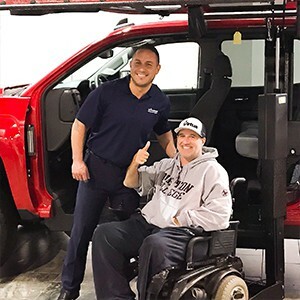 Steve suffered a severed spinal cord and needed to adpated to becoming a quadriplegic, Throughout his rehablalation he used the idea of driving again his motivation. Being an avid sportsman it was clear the popular vehicle to individuals in wheelchairs was not 4X4 trucks but rather minivans. His first van only lasted 8 years, falling completley apart the day came to replace the van and the thought of buying another van was not an option. No matter which lowered floor van conversion he looked at they all had very low ground clearances, excessive road noises and didn't his lifestyler.Wanting a truck, Steve call a friend who was an engineer and said we need to build a wheelchair accessible truck. They soon found answers to their questions, using Steve's measurments to create a design and with the help from a couple friends they finished there first wheelchair accessible truck. 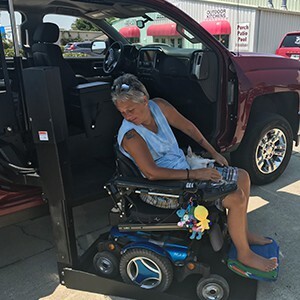 Exposure of the ATC wheelchair accessible conversion on our trucks lead to request to make the popular GM Suvs wheelchair accessible. Read below to discover all the differnt GM SUV models that All Terrain Conversions convert to be wheelchair accessible. Opeing the door with a Gullwing Design door allows the hyrdaulic design lift to lower the wheelchair from inside the truck to the ground. 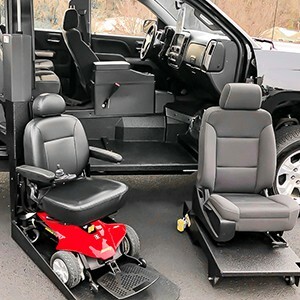 Load or unload every ATC wheelchair accessible truck quickly taking under 25 seconds. All Terrain Conversion stands behind each conversion with a 5yr/100,000 warranty building the lift to outlast the truck. 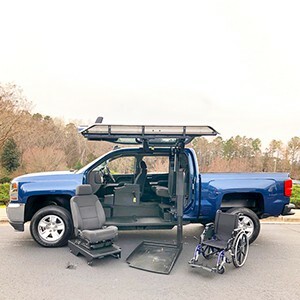 The rugged ATC wheelchair accesssible conversion is available on the Chevy Tahoe/Suburban, GMC Yukon/Yukon XL & Cadalliac Escalade/Escalade ESV with either 4WD or 2WD models. 2WD models will accomadate many popular wheelchairs, the 4WD models will offer less space, with either application we recomend you contact your local All Terrain Conversion dealer so they can complete a Quantifier worksheet collecting detailed demensions of your wheelchair. With this we can determine which model would work best in each siuation. All Terrain Conversions are sold & serviced through dealers across the United States. Many of our dealers have been in the wheelchair accessible vehicle industry for over 20 years and are staffed with trained mobility experts. Our dealers were as excited as anyone to see wheelchair accessible trucks & suvs being developed. ATC dealers understand the importance of your vehicle, they are mobility experts who can answer all your questions and assist you in determing which model will fit your needs and exceed your expectations.